I may be one, but the Brits amuse me when they get into a froth about the televising of F1. The debate sparked by the transfer of F1 rights from ITV to the BBC has been incomprehensible to most foreigners as the merits of one commentator or another are compared. Most of the names are meaningless even to me and I used to live there! When it comes down to it, they are arguing over those little bits tacked on to the standard FOM product where the Brit talking heads pontificate on various aspects of the scene or one of them sallies forth on to the grid to ask silly questions of some celebrity who has not managed to duck them. Does it really make that much difference whether it is the matey Martin Brundle putting the questions or the obsequious Peter Windsor? To me, it is the race that counts and I would quite happily watch the broadcast without commentary. I know it is a necessary thing since we are not all so obsessed with the sport that we can recognize Vitantonio Liuzzi in a crowd and from a hundred paces. But the way the Brits complain about James Allen and worship that national institution, Murray Walker, seems slightly ridiculous. They are all just guys who talk faster than their brains work, that is all. But when it seems that the FIA are trying to prevent the BBC from taking on one of their chosen commentators, we all have to sit up and take notice. According to the Daily Mail and as commented on by Doctor Vee, the FIA's Alan Donnelly is trying to prevent the BBC from employing Martin Brundle for their coverage of F1. Martin was the subject of Max Mosley's wrath over comments made over the McLaren spygate affair last year and the commentator and ex-driver was threatened with litigation (subsequently withdrawn) by the FIA. If this is true, it sheds yet more light on how low the governing body will stoop in its quest to silence criticism of its actions. One can only speculate on the dark deeds they seek to cover up when this kind of thing is their response to any critical appraisal. At the very least, it is mean-spirited of any organization to seek to interfere in a critic's prospects for employment. Surely this must focus our thoughts once again on the character of the man who leads the FIA, Max Mosley. This is the guy who habitually bullies his way through negotiations on new rules by threatening changes that would destroy the sport, who pursues vendettas to the extent of seeking to have a nation's laws altered to suit himself and who talks of cutting costs after having fined one of the teams 100 million dollars on very questionable evidence. For those who think that a man's private life has no bearing on his suitability for a job, this must be unsettling, to put it mildly. The plain fact is that a lack of morality in private will inevitable carry through to the way a person approaches his work. If Mosley sees nothing wrong in betraying his wife and children by the employment of prostitutes to satisfy his somewhat unusual tastes, he will carry out his duties as FIA president with the same disregard for normal morality. That is a contentious claim in a world that has decided that anything goes (except disagreement with the claims of the climate change alarmists) and it is only mentioned in this blog because Mosley makes it relevant. Suffice to say that F1 as an international sport does not need such a controversial incumbent as its figurehead. It is not asking too much of any applicant for such a post that his standards be above those of ordinary men. The cynics amongst us will say that is how the world works today - those with money and power may behave as they wish (perhaps it was always so). But that does not mean we cannot protest and demand that they be replaced with people in whom we have more confidence. And it is confidence that is the issue. Mosley may have been able to manipulate the FIA delegates to give him a dubious vote of confidence but the confidence of the fans has been shattered. We may be powerless and have nothing but our love for the sport to set against the powers that be, but we can be heard, at least. The very fact that Donnelly found it necessary to give some sort of answer to the criticism of the stewards' decisions is evidence that we are making enough noise to be heard in the corridors of power. And, for once, I think we should raise a huge stink about the attempt to influence the BBC's employment of Martin Brundle. 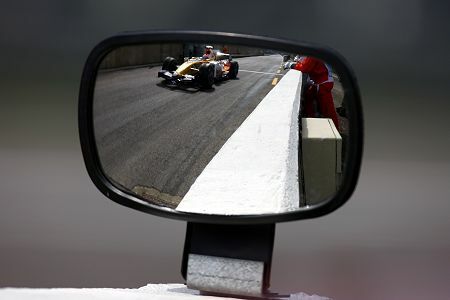 It makes no difference to me how the Beeb chooses to present F1 to its audience - I will not see much of it, that is certain. But I do care when the arbiters of the sport try to change the field of play to suit themselves. I, too, couldn't give a whit about who does the commentary for the BBC. That said, I find it rather shallow for the FIA to try and ban Mr. Brundle from doing a job he's obviously qualified to do based upon his comments regarding Spygate. I wonder if there's anything in the broadcast contract that allows this...or is this just another sad example of Max throwing his weight around in a very unflattering vindictive manner? And the beat goes on. All commentators are equally bad. All think their national driver is some kind of god, and all go mental every 5 minutes. On ITV i find particularly anoying that guy that is on the grid pushing around everyone, putting his mic and camera in front of other reporters that were already there and that asks a lot of non important stuff. Murray Walker, from the very few occasions I have heard him, was pure rubish, wasn't he? Brundle is the best thing to happen to F1 coverage since Murray Walker. Murray brought enthusiasm and at times his enthusiasm was enough to make you forget that the racing was deadly dull. Brundle bring knowledge and intelligence that few 'expert' commentators bring to any sport. He has now 6 times won the award for 'expert' commentators. These are generally former sportsmen commentating on their sport and providing insight. The idea that the FIA is so corrupt that it thinks it should be able to control the media is shocking if not remotely surprising. I am never surprised to find that the FIA are putting time money and effort into things that will have little effect on their product. Changing TV commentators will not improve the product. Engines that last for 2 or 3 races will not improve the product. When are the FIA going to tackle the major problems affecting the sport? It is a good job for the FIA that their product does not come under the auspices of the trades description act. That act says that any product must be fit for the purpose it is intended for. Mosley has given us racing cars that cannot race. The problem is aero. We all know the problem and we all know the solution. But the FIA have no interest in tackling them. Far better to spend time shutting up an ex-driver and TV commentator. We know he is decended from book burners but you would think he would try to break away from that. Haplo: I must be careful not to criticize commentators in other languages since I rarely understand much of what they say (I have some French and smatterings of Dutch, German and Spanish). There is no doubting their enthusiasm, however! I think the British are so keen on their memories of Murray Walker because he was (for a Brit) enthusiastic and excitable. During his heyday, I remember him as being constantly criticized for his mistakes and he was generally regarded as a joke. Now his glaring errors are remembered fondly and he is held up as the ideal for others to emulate. Just one of those strange Brit things, I suppose. We also make much of our defeats, as long as we put on a good show doing it - Dunkirk, for instance. Steven: Murray Walker is one of those sore spots on the British psyche that I delight in prodding occasionally just to get a yell of protest. I really do think he is greatly over-rated these days, his multitude of mistakes being much more irritating than we remember. But it doesn't matter to me and, if we Brits want to elevate him to national institution status, it's no skin off my nose; indeed, I understand our need to pick some mighty strange heroes at times. My conclusion on Max is that he is utterly without shame. And that speaks volumes for the extent of corruption within the man. This is the same Alan Donnelly who sits as a permanent assistant to the chief stewards? Never mind the trades description act Steven , I find it hard to believe at the moment if Max and co keep acting like this they won't get into some serious bother with someone - I hope Mercedes haven't payed a single cent of the $100m fine they were given because I'd like to see how that would stand up in court. Yes, it is the same Alan Donnelly, Francois. He seems to be Max's right hand man of the moment. I am quite sure that, were F1 anything more important than "just a sport", Max would have been removed by now. The rest of the world tend not to notice the enormous investment of major companies in the sport and so it is dismissed as little more than an entertainment. It is fair to Murray polarises opinion and always he did. I have to say while some people look at him with rose coloured glasses I am not one. I always defended him against such crtisicism and told people that after he retired they would look back more positively on him. For one more race we have the universally loathed James Allen. No-one likes his commentary and for me it did not matter who followed Murray they were on a hiding to nothing. Hopefully the BBC can fid someone who is better. My favourite commentator was James Hunt. He had a marvellous, wry sense of humour to him and a great knowledge of the sport. I rue the fact he is no longer with us for I would have enjoyed his take on Mosley. I was hoping the BBC were going to get someone who actually spoke English, but since Brundle is such a thorn in Mosley's side, better still. The hell with the form! Bring on the function. Just when you think you have heard it all. Are there no depths S&Max and Mini Me won't stoop to? Nick: If I have a favorite F1 commentator it has to be James Hunt. He never said much but, when he chose to say something, it was always a revealing insight delivered with great humour. I still miss him. Peril: It's like watching a farce where the characters keep digging themselves into deeper trouble and it would be as funny, were it not for the fact that they are dragging down F1 with them. I met James Hunt in the mid 80s. What a disappointment. Without doubt the least impressive human being I ever met. Steven Roy - do tell ! Murray Walker was an awful commentator. His horrible bias for his favourite English drivers and constant mistakes were at times unbearable (I tended to mute the television). James Allen is a lot like Murray Walker. Martin Brundle on the other hand brings articulate, reasoned intelligence to the race commentary (and I mean race commentary, not the grid walks). Much as the late James Hunt provided a voice of calm alongside Murray Walker, Martin Brundle provides an antitheses to James Allen's moronic shrieking. Choice of race commentator is very important. Without Brundle's presence I would have stopped watching F1 altogether last year. James Allen's hysteria for Lewis Hamilton is nauseating. I disagree that the commentators are meaningless. Good commentators drive enthusiasm into the viewers and can make a mudane programme exciting. Murray walker is one of my all time favourite commentators as everything sounded exciting! He loves motor racing and it showed in how he portrayed what was happening on the track. Since he retired I have never been quite as excited about a back marker passing another back marker. He got things wrong but then no one is perfect and I would rather an exciting enthusiastic commentator who get things wrong than a mundane commentator who gets everything correct. I am also glad that the BBC have got F1 back as there is no better place for sports coverage. The BBCs sports coverage is second only to their stunning documentaries and they are leaders at using digital services. Maybe we may just get that promised follow the driver channel now. Also I imagine it will all be in glorious HD as well. Shouldn't Allan Donnelly be brushing up on some racing knowledge (which he is clearly lacking) rather than worrying about which commentator the BBC use? Max gets more like his father every day. Marlboro were doing one of their find a new racing driver competitions at Silverstone. They had some stupid write in competition and 1000 of us were invited to Silverstone to see if we could drive. They booked the track for 5 days with 200 people each day. On my day I got through the first stage which got me into the last 20. Then we had a second run in much abused XR3s. My examiner was Andrew Gilbert-Scott now Sato's manager. Clearly such things as polite conversation and manners were beneath him as beyond basic instructions he never deigned to speak to me. So the combination of instant dislike and a brake pedal that was on the floor saw me leave the competition at that stage. I knew people who went a lot further in the competition and they were not as good as me but I am not bitter. Anyway as well as meeting someone who had the best name ever for a racing driver - Mario Ferrari - I met Hunt who was there to present prizes and certificates. He was dressed like a tramp. Grotty vest and shorts and a pair of what had once been white gym shoes. He walked like a Thunderbird puppet. Every time he was needed they had to put a call out on the PA system as he was AWOL in the bar. Everywhere he went he was followed by this dopey German Shepherd which was the only living thing on the planet which made him look alert. Everytime he stopped walking this thing dropped like it had been shot and collapsed in a heap. The first time I did it I thought it had died. Eventually I was presented with my certificate and you would think meeting a world champion would be special. Especially as he was the first F1 driver I had ever met but I just felt sorry for him. He said something to me but I have no idea what. Well, I stand corrected - I guess the choice of commentator is more important than I had thought. This seems as good a moment as any to admit that I don't really notice them, however - unless they're so intrusive as to be distracting. I can't count how many times my wife has said something in response to a commentator's opinion during a race and I've had to admit that I wasn't listening to the commentary. Chacun a son gout, as Monsieur Prost would say. As for James Hunt, Steven, you've described exactly why some of us loved him. He was the archetypical anti-establishment figure, generally in a mess (social life as well as appearance) but willing to say the things that we all were thinking. I guess it all depends on the moment too - there were times when only a wry comment from James could make up for a Murray gaffe. I knew a bloke who worked on Nigel Mansell`s house in Devon, he told me a story of how one of the builders was a Mansell maniac and upon seeing He`s hero he said to him " Hello Nigel" upon which Nigel replied while looking down he`s nose like He was something he trod in " It`s Mr Mansell to you" and then walked off, the worst thing though was that he had him removed from site the next day, perhaps if he had not been such a prick the locals might not of put up such resistance to he`s proposed race track, and I wonder if he evegr did locate the dead fish behind the dry wall ! Clive, if your not writing the piece as we speak have you seen Luca`s latest planned chat with the FIA, must be taking a page out of Max`s "change the laws because I say so" book. quite frankly it's just one more outrage and abuse of power to heap onto the steaming mosley pile. i remember brundle's piece and ok, i'm not a lawyer but i couldn't see there was one word that could be construed as libel, slander or anything other than the opinion of the writer because that is exactly how brundle presented it -as his own opinion. and i'll weigh in on brundle's defense as a sports commentator. in the some of the race outtakes i've seen over on f1 fanatic have been from the itv feed and i think brundle is brilliant. he speaks plainly and he catches what is actually going on alot sooner than anyone else on the team. he and steve matchett would make a brilliant team and hey, if the beeb drops him, tough on them. send him our way. nothing against james allan, he used to do the espn coverage back in the '90's and they pretty much had him doing the fringe human interest pieces. it suited him and i could see how likeable he'd be because he more or less portrayed "joe the f1 fan". maybe he should have stuck to that. or maybe it just played better here in the u.s. because some of the things i read that people say he says...he'd make me laugh, too-and i am not even that savvy about f1 details. I can see why Kimi idolises Hunt then Steven. Mario Ferrari is a pretty cool name for a driver, but it doesn't beat my all time favourite - Will Power. And Gusto, what a prick. Sounds like he deserved the dead fish ! I tell the story in a kinder fashion that what happened, but he said it was a Nightmare of a job. And God help you if you smoked on He`s country retreat, you would of never of guessed the Tobacco Industry paid for it. I read a while back that Martin Brundle will indeed be part of the team. He is to be joined by the BBC Radio Five Live mainstay Jonathan Legard, who will add his knowledgable voice to the process. Frontman Steve Rider is to be replaced by Jake Humphrey, a former childrens TV presenter. This cannot be a bad thing, Steve tries to hard to be nice. How Jake will fare remains to be seen. Mark Blundell will not be present; So cause for celebration there. Whatever possesed the producers at ITV to drag him into things in the first place is beyond my comprehension. The replacement for Blundell is (so I gather) one David Coulthard. The Coulthard factor could be a good move. His no-nonsense take on all things F1 will hopeffully be refreshing and controversial. No place either for James allen which is probably the best news. I think it safe to say that he will NOT be missed. Louise Goodman and Ted Kravitz are also gone and I have no idea who (if anyone) will be in the pit lane. The British love of Murray Walker was misplaced. Murray was indeed hopeless but he endeared himself to the Nation simply by shedding tears on air when Aryton Senna died. Indeed he did the same when James Hunt - bless him, passed away. Murrayisms have entered into the British consciousness. Which is a pity because most are simply gaffes that are only midly musing at best. But the love we have of buffoons will stay around for many years to come. Overall though, my only reason for having the sound on at all is because the presenters can tell the drivers apart much, much quicker than I can. That, and the fact that I also get to hear the sound of engines working at fever pitch. c) Britain regards itself as having the best F1 TV commentary in the world. This dates back to the days when Walker's commentary was revered worldwide in the late 1980s and 1990s, but the fact that a lot of Britons stopped watching F1 for other reasons early in James Allen's era means that a lot of people who might become casual supporters of F1 again probably think that his commentary has matured into just as well-respected a part of ITV's offering as Walker's used to be. Britain therefore expects the next lead commentator to be up there in internation respect as Walker was (and Brundle actually is). While this is less of a problem for the BBC since it runs Radio Five Live, the in-house competition will be boosted if it gets the best possible commentators for both the TV and radio strands. So this gives some sort of idea as to why the matter of F1 TV commentators is seen as so important in Britain. Fractal: The BBC team was announced some time ago with the members just as you say. Since then, everything has gone quiet and no official statements forthcoming. It seems that everything is not quite as written in stone as we had assumed. As for Murray, there are two views on him, I think. I happen to belong to the group that do not think he was very good but I do not begrudge him his iconic status - his length of service at least has earned something, perhaps.